Bluegrass banjo has all the drive, excitement, rhythmic complexity and melodic possibilities that you could want in an instrument. This collection of lessons, compiled from Homespun's vast library of music instruction, covers a variety of skills and tunes. The segments are graded to take you from elementary to advanced levels, and will open up myriad playing possibilities while allowing you to sample lessons before purchasing any of these DVDs in full. Taught by seven of our most celebrated pickers, this collection will expand your repertoire, improve your technique and enhance your musical knowledge. Before long you'll be tackling everything from working on your basic rolls to playing hot bluegrass solos. RALPH STANLEY Little Maggie (from “The Banjo of Ralph Stanley”) Download now from PlayBetterBluegrass.com! Beginning with basic left- and right-hand techniques, Dennis Caplinger guides you through developing great backup parts and playing all over the neck. You'll learn the classic Scruggs style of picking along with the "melodic style." Plus you'll study over 20 classic bluegrass standards, and you'll learn how to play them in several different styles. 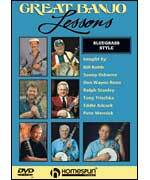 All books in the Ultimate Beginner Bluegrass Basics series are fully correlated to work together. This is the ideal method for the family that wants to play music together!